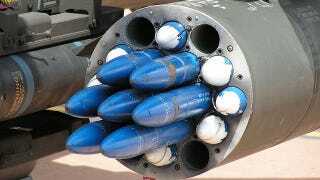 Destroying enemy vehicles would be a lot easier if the little SOB's would just sit still and take what's coming to them—what's coming being a 2.5-inch Hydra-70 rocket. But of course they don't, so the Navy's upgrading its existing stock of rockets with Low-Cost Imaging Terminal Seeker technology. Let's see them run now. LCITS uses infrared homing—a passive guidance system that exploits the target's heat signature to track and lock-on—heat seekers, simply. Specifically, they measure the target's electromagnetic radiation in the infrared spectrum that is radiated by warm bodies. It's an extremely efficient tracking technology—90 percent of all US air combat losses have come from heat seekers over the past 25 years—and, unlike laser-guided weapons, which need the operator maintain a visual on the target until the projectile hits, LCITS is a "fire-and-forget" technology. According to Ken Heeke, the ONR program officer for the program, "No longer do you have to continue to monitor the target after you've fired the weapon. You can move on to the next threat with the assurance that the rocket will hit the target." The new sensor package has been installed in the head of the Hydar-70, a rocket originally developed by the Navy in the 1940's. It was based on the 2.75 inch Mk 40 motor-based folding fin aerial rocket but has a longer propellant grain and a significantly higher amount thrust at 1335 lbs. The ordnance saw extensive use in both Vietnam and Korea is now standard issue on the OH-58D(R) Kiowa Warrior, AH-64D Apache Longbow and the USMC's AH-1 Cobra. In a recent test of the newly upgraded technology, a shore-based launcher to fire two LCITS at a group of five small maneuvering boats. The rockets used internal guidance to navigate within range before the heat-seeking took over. At that point the on-board infrared imaging system correctly identified the two intended targets and intercepted them, despite the boats' efforts to avoid.